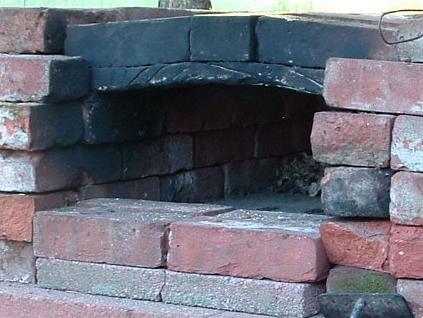 This is the brick oven for those who wake up Saturday morning and think "It would be nice to have a brick-oven calzone for dinner". Nothing is set in mortar; nothing is going to have to be jack-hammered out of your backyard if you change your mind; and it really works! What it lacks in aesthetics it more than makes up for in (nearly) instant gratification. The longest part of the process is waiting for the fire to heat things up. If you just want to experiment with some personal pizzas, calzones, baked potatoes, this is for you. 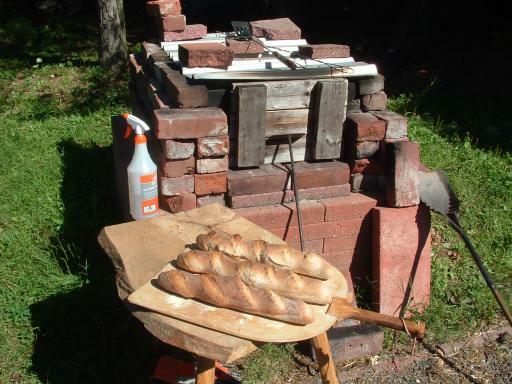 I got inspired with the Brick Oven Pages (that's where you'll find nice brick ovens). Not sure where to put such a permanent oven as I had seen on the Brick Oven Pages, I recalled an architectural coffee-table book about some region of Italy (I think) where the people have, for generations, disassembled the unmortared stone houses - converting them into stone walls when the tax collector was coming - and reassembling when the taxman was gone. That sounded just right for my indecision. I had an assortment of masonry pieces at the back of my field and figured it was worth a try. What is needed is a chamber for the fire and food, and a mass of masonry to store the heat. A chamber without laying up a vaulted dome seemed like a quick and cheesy approach. The "design" is based on a single 6"x10" red clay flue-liner as the chamber, and a pile of fairly ordinary bricks to add mass. There is no chimney and no door. It is set on a base of ordinary cement blocks with one layer of colored (not necessary) cement pavers (~2.25"x8"x16"). I don't think much is needed of construction details. The flue-liner is laid horizontally on the concrete pavers; the pavers are on the concrete block base. The back of the flue-liner is closed with the dry-stacked brick you see protruding at the back - a little air leaks in. Lay up a few layers of dry-stacked brick over the top of the flue-liner to add mass.There are 6 standard concrete blocks (base), 3 pavers under the flue-liner, and about 80 bricks in the unit. 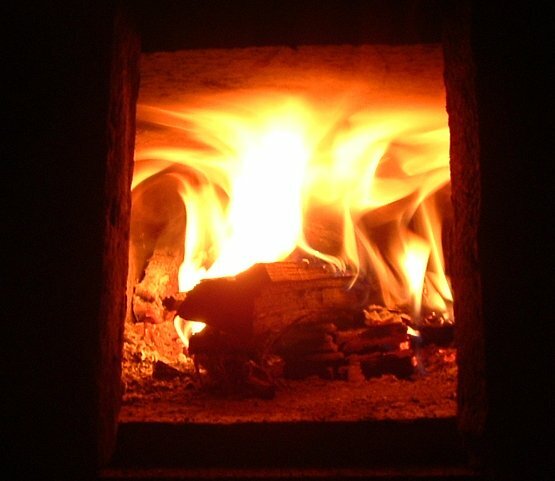 Build a small fire at the front and ease it to the back of the chamber once it is going so the flame-path is longer in the chamber. Once you have a small fire, 2 or 3 chunks of wood about the size of a brick burn slowly and don't require such frequent tending. I heats in a few hours. Once it is hot and the fire is down to coals it doesn't require as much air so I close the front a little bit with bricks to retain heat better. 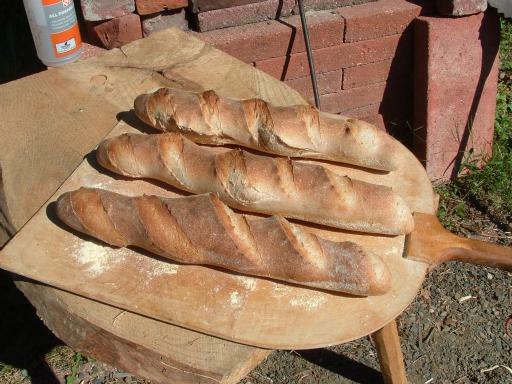 I have only fired it 3 times as I write this but the edible output was fantastic. The flue-liner has cracked lengthwise top and bottom, but the chamber didn't collapse (yet). I think the flue-liners are more for acid/creosote resistance than direct-fire; maybe I just fired it too fast and hot. But it works even with the cracks. To cook, I pushed the ash and remaining coals to the back. I used an oven thermometer to check the temperature which easily got beyond the 550F max. Personal pizzas cooked in less than a minute when set in the middle. Calzones were cooked a little closer to the front and rotated a couple of times to cook quickly but not burn; the remaining coals, or higher temp deeper toward the interior cook that side of the food more quickly. Put a few potatoes in when you have finished the hot cooking and they bake nicely as it cools down. OK, do I get the "Red Green Award"? 6/23/2006 - UPDATE..... 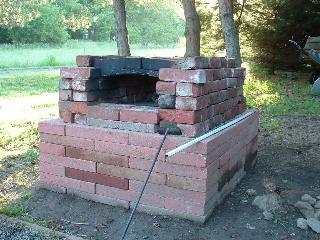 The new dry-stacked brick oven is complete and being used/tested. I purchased 2 bags of Rutland #601 and cast a 28" x 24" slightly arched slab for the ceiling of the new oven. The new oven has a hearth of standard firebrick, and the ceiling slab is set on top of double layer walls of some generic soft/sandy brick to give a chamber 17" wide and 26" deep and ~9" high. There is a second layer of brick (double walls, and one layer on top of the ceiling slab) to add mass. I have fired it to > 650 F twice and there is no evidence of cracking. When I first fired it, I did so gently, but the slab and bricks were wet and it took some hours to dry out, and the ceiling slab was actually sizzling with water being drive to the upper side and boiling, but nothing has cracked. A note about wood consumption. For the second firing, with the bricks dried out, I used only 2 pieces of oak 24" long and about 4" square (cut and split to smaller chunks) to reach the (too hot) 600+ F temperature in about 2 hours.